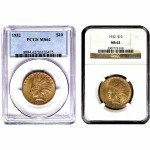 Customers: Please note that these coins will be certified by the PCGS OR NGC and graded as MS63 condition. Coins will be from years of our choice, all of which will range from 1856 to 1889. The Type III $1 Indian Gold Coin was first released in 1856. The term “type III” refers to its design, which was the third and final version of the $1 gold coin. It enjoyed circulation until the Act of September 26, 1890 abolished the use of $1 and $3 gold coins as currency. 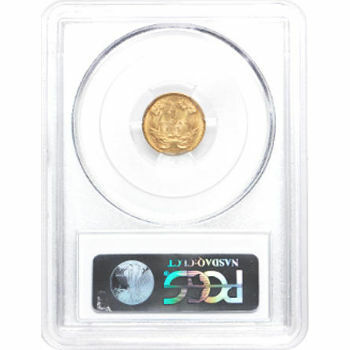 As the last gold dollar ever produced by the United States Mint, the Type III $1 Indian Gold Coin remains a popular favorite among coin collectors. 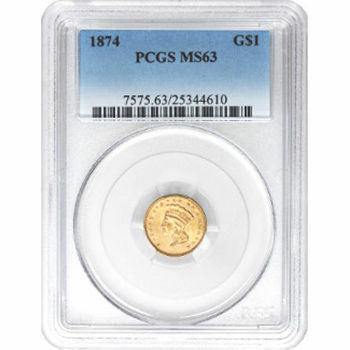 All $1 Indian gold coins featured in this collection have been certified with an MS63 (Mint State 63) grade by either the NGC (Numismatic Guaranty Corporation) or the PCGS (Professional Coin Grading Service). An MS63 grade indicates that the coin is in acceptable condition despite the noticeable presence of contact and hairline marks. To prevent any further deterioration, each coin has been kept sealed in their official NGC or PCGS examination slab. In many ways, the revised artwork of the $1 Indian Gold Coin served as a reflection of the shift occurring in our nation’s identity at that point in history. On the obverse of the coin, designers replaced Lady Liberty’s inscribed crown with a feathered war bonnet. Attiring such an iconic American figure in an indigenous headpiece can be interpreted as the nation’s new willingness to not only appreciate these cultures, but also an attempt to integrate them into its identity. Another revision worth noting is our nation’s name, which has replaced the border of thirteen stars. This particular change suggests that America was truly starting to view itself as an actual nation rather than just an extension of the original thirteen colonies. Lastly, on the reverse side of the coin, designers revised the original wreath to include a variety of different crops, which suggests a growing sense of pride for the many distinct farming territories that were contributing to its economy. With such artistic and historical significance, this Type III $1 Indian Gold Dollar Coin will no doubt become a treasured heirloom for generations to come. If you are interested in learning more about this coin, give us a call at 1-888-989-7223. Our staff would be happy to answer any of your questions. We are also available through live chat and email.